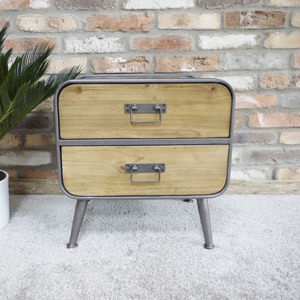 Stylish retro, industrial chest of drawers for an urban chic, modern themed interior. With matching furniture available for the bedroom, living room and hallway. The Retro Range offers a unique charm with it's mix of retro and industrial. This furniture is perfect anyone that loves the loft living look. Four drawer storage in a 2 over 2 design for keeping clothes organised and tidy. 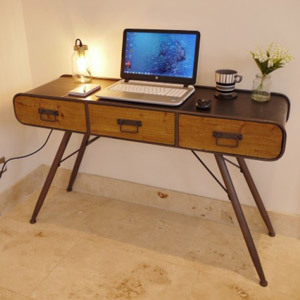 Stylish retro, industrial chest of drawers for an urban chic, modern themed interior. With matching furniture available for the bedroom, living room and hallway. The Retro Range offers a unique charm with it's mix of retro and industrial. This furniture is perfect anyone that loves the loft living look. Four drawer storage in a 2 over 2 design for keeping clothes organised and tidy. Constructed with a grey metal framed body and wooden drawer fronts. The bedside requires minimal assembly with just the legs to attach. We have the best selection of furniture for your home with so many styles to choose from, check out all of our ranges to find the perfect furniture set for you.